Well I don't know about you folks but walking into a Vietnamese shop if you're not Vietnamese (and you've never been in) it's a little bit daunting. Specially if all that's going to happen is you walk with a bag of funny shaped vegetables of unknown tastes and textures!!! Yikes! I'm outta here. So here goes green things first! Now you'd be forgiven when you get to shop for saying which mint was I after again? Reminds me of Resevoir Dogs, I could never remember which was which, or how many there were!! Yep! Get it at any supermarket or good vegetable shop. I love to freshen up our summer rolls with a good wedge of this, balances out the pork belly and the other meats and when combined with the dipping sauce wowza! Cockscomb Mint (Kinh Gioi) This a light aromatic mint with delicate lemon zestyness about it, Le (Uyens mum) made a Bun Bo Hue (hot and spicy beef noodle soup) for me one night. 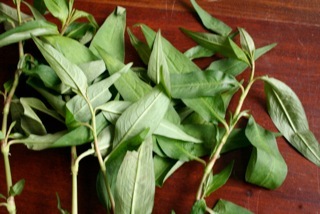 The key flavours are that of the lemon grass in the broth, and the Cockscomb mint in the garnish. It has delicate lemony flavour which is quite simply a stunning combination. We've since put it on the menu. Quite a strong flavour minty yet meaty. 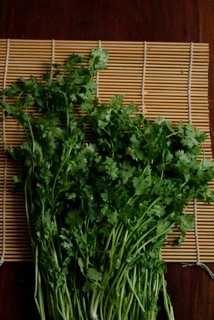 Looks nothing like normal coriander, larger leaves will have a slightly purple tinge around the edge slightly bitter, pungent flavour. We grow this in our back yard with no problems, we got it from a herb seller in Columbia Rd market (where we got our lemon grass actually). We use this in our summer rolls, and chicken salad. And at this point thing get really confusing because this bad boy has quite a few aliases. 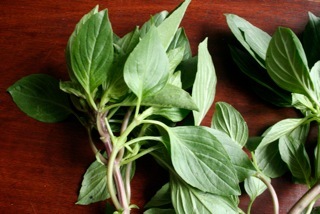 It's known as Vietnanese Corriander (took me a while to realise this), also known as Laksa leaf, and Cambodian Mint!!! What the hell have you been up to to have so many aliases, hmmm? Late breaking news easiest just to call it 'Rau Rum'. This is rather an acquired taste and when I first took a bite I did wonder what on earth it could be good for, but used sparingly it can add a depth and a little je ne sias quoi to the flavour! Err . . . gone all Dell boy there scuse me! 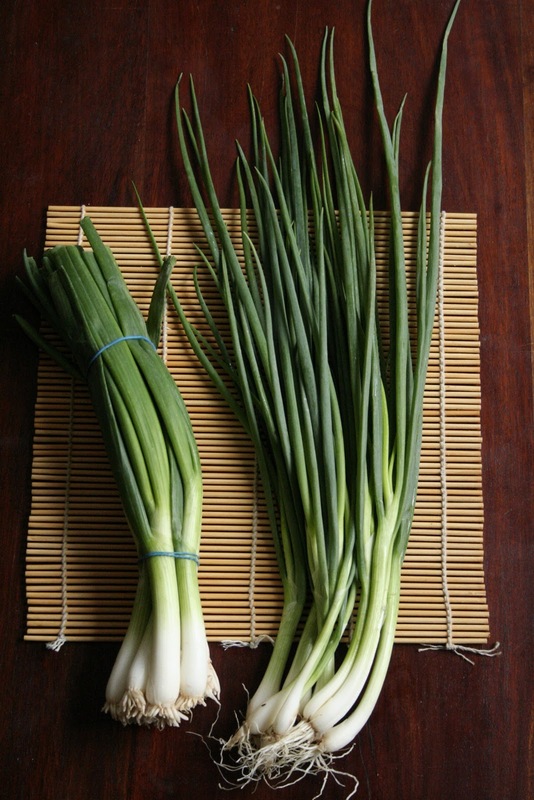 I've sat these next to a bunch of european spring onions for comparison, they taste nothing like each other despite their similarity to chives, you find them in Vietnamese pancakes which are lovely!! In fact had some of those on Tuesday night. Tried them in Vietnamese stall for that authentic understanding of what to aim at. 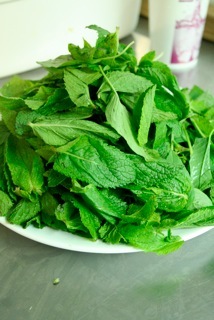 We use this in: bun bo hue, pho, beef in vine leaves, prawn salad...to name but a few. Well where would be be without it I say, this has a gorgeously refreshing, but like a lot of things opinion is divided on this one some people find is flavour a little too strong for them!! They is crazy brother! Tastes like a crunchy coriander but more potent. Used sliced up in in noodle soups like Pho as a garnish. Long leaf looks like a pond leaf but it actually comes from a tree. It's a sweet leaf used to make tea and for for desserts - blended into cakes and jellies. This ones a new one to me, bumped into it in a Dried Logan Berry and Lotus Seed dessert. As you can probably tell from that rather brief coverage of the choi family, I think a cor blimey, I'm exhausted is due! But there's no garlic or fish sauce on this list!! ?